Posted in Blog Hops, Books, Search for Camelot, Sneak Peek Sunday - 6-Paragraph Excerpts! Tagged Camelot, Delynn Royer, Excalibur, Glastonbury, light historical romance, romantic comedy, Sneak Peek Sunday - 6-Paragraph Excerpts! Today’s peek is from SEARCH FOR CAMELOT, a romantic comedy about a wisecracking American college student and a cool-mannered British bluestocking who find love when they join together to search for the fabled sword Excalibur. In last week’s peek, Chelsea and Arthur confirmed that, not only is the parchment authentic, but King Arthur too is more than the stuff of legend. He was a mysterious fifth century military leader who once walked the earth in a place called Glastonbury. In today’s peek, as Arthur and Chelsea set their sights on Glastonbury, trouble is brewing elsewhere. They are not alone in their quest. They have a rival, a resourceful competitor who will stop at nothing to lay his hands on the clue contained in Arthur’s parchment . . .
“Yes, sir.” Thackery’s immaculate shoes made no sound as he strode across the floral carpet and vanished through the open double doors. Moments later, Geoffrey Dark was sweeping those doors closed to gain privacy. “You have it?” Blake closed an account book and pushed it aside. He rubbed his hands together, then began cracking his knuckles, an exercise designed to distract him from the burgeoning swell of anticipation that might overwhelm him at any moment. That swell was both exquisite and painful, almost sexual in its intensity, an approaching climax that, in this case, was almost ten years in building. That was how long Blake had been searching for the sword. Not precisely? Blake stopped cracking his knuckles. Geoffrey remained still as a lizard. One blink. Two. That was all. Geoffrey’s reptilian stare seemed even deader than usual. Blake suspected Geoffrey was experiencing a certain level of job frustration. And so the race is on. Will Arthur and Chelsea make it to Glastonbury before their fellow sword-hunters? For more fun sneak peeks, be sure to hop on over to SNEAK PEEK SUNDAY HERE! Welcome to Sara Walter Ellwood’s Sneak Peek Sunday! This week’s peek is from Search for Camelot, a romantic comedy about a wisecracking American college student and a cool-mannered British bluestocking who find love when they join together to search for the fabled sword Excalibur. Meet our hero, a charming but penniless college student, Arthur Pierce. Arthur was raised on his late mother’s bedtime stories of Camelot, but growing up in a family of sharpers taught him that only suckers believe in dreams. Arthur learns of the unconventional terms of his wealthy Uncle Sidney’s will when he’s visited before his college graduation by an eccentric British solicitor, Maxwell Hamilton. Arthur closed his eyes to dispel the tenacious remnants of old dreams. When he opened them again, the words were still there, but the images were gone, wisps of smoke stolen back to the deep recesses of childhood memory. Arthur was familiar with those legends. They contended that King Arthur and his attendants were passing the centuries asleep in an enchanted cave, awaiting the day when they would be summoned to rise again . . .
Arthur frowned at the direction of his thoughts and tossed his pencil aside. He barely remembered his Uncle Sidney, but what little he did remember, he recalled with a mix of affection and reverence. Sidney Pierce had been a master of the Big Con. In the end, though, it appeared that he had been reduced to the unseemly role of a gullible mark. This idea not only saddened Arthur, it made him angry. “It’s a hoax,” he said. Is Arthur right? Is the parchment a fake? Or could this final clue from his uncle’s unfinished quest to find Excalibur be the real thing? Posted in Blog Hops, Books, Search for Camelot, Sneak Peek Sunday - 6-Paragraph Excerpts! 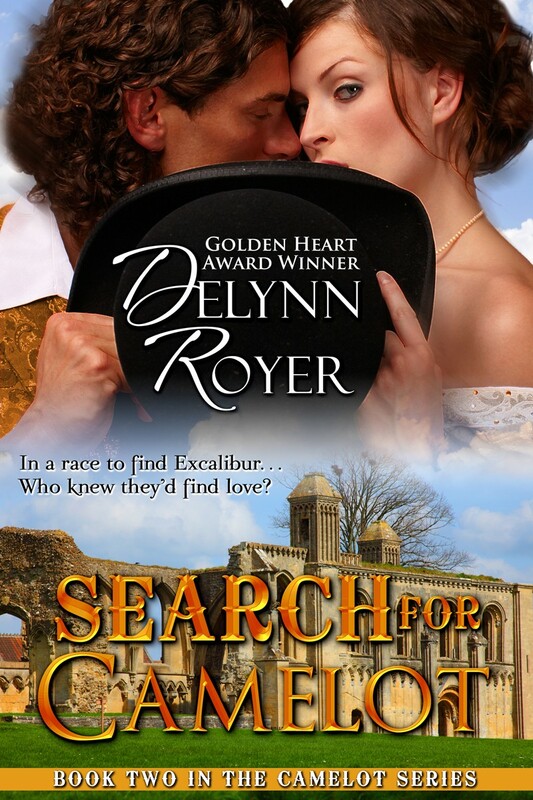 Tagged books, Camelot, Delynn Royer, Excalibur, light historical romance, romantic comedy, Search for Camelot, Sneak Peek Sunday - 6-Paragraph Excerpts!